It’s still not clear exactly what will happen on 29 March. Prime Minister Theresa May is working overtime to find support for her Brexit deal even as Speaker John Bercow ruled out a third Meaningful Vote on what is essentially the same agreement. Parliament has voted to request an extension to the two-year Article 50 negotiating period but there is still no clarity on whether this will be granted by the EU or how long it might last. On Tuesday, May ruled out a long delay, which some say could increase the chances of no deal. Leaving the customs union could create headaches surrounding rules-of-origin, and will also introduce tariffs on goods. EU-bound shipments will be subject to Brussels’ World Trade Organisation (WTO) tariff schedule – a list of tariffs that apply to countries with whom the EU does not have some form of preferential/free trade deal. The average trade-weighted tariff the UK would have to pay over its exports to the EU is 3.9%. However, there’s a big variation in tariff rates across different products. 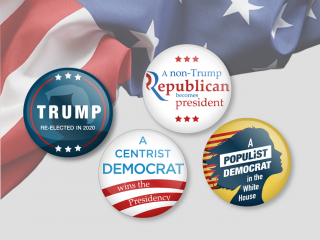 Apparel, cars and agricultural products tend to face the steepest tariffs. The highest rates are on dairy and agricultural products with () tariffs for some particular types of products as high as 178%. Ad Valorem Equivalent Tariffs, are tariff rates, principally, specified as a duty per volume unit (Kg / L / Metric Tone / Etc.) converted to implied Ad Valorem Tariffs. However the UK does not have to respond in kind. The government has already released a temporary tariff schedule, which it will be implementing in case of a no-deal Brexit. Although high tariffs on cars and agricultural products will remain, a significant proportion of tariffs on other products would be sliced to zero. This is a bold decision that would erode the competitiveness of British companies on the local market. 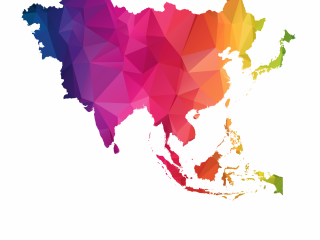 If permanent, It would also make it more difficult to strike free-trade deals with the rest of the world, as there would not be much left to offer in terms of tariff reductions. With that in mind, these tariffs are unlikely to remain beyond the initial 12-month term. Let’s assume for a minute that the UK ultimately decides to mirror the EU’s list of tariffs. In this case, the average rate that would be applied to EU exports to the UK would average 6%. However, because the basket of exports to the UK varies significantly from one EU country to the next, this percentage would be different for each member state. Ireland, for example, exports a lot of diary, meat and agricultural products that are subject to higher-than-average duties. For some other countries, the opposite is true. Finnish exports, for example, are dominated by paper and wood products, for which tariffs are typically low. 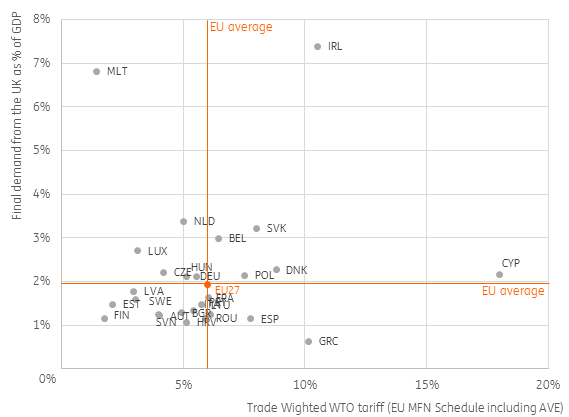 In addition to trade-weighted average tariffs, some countries trade- either directly or indirectly- with the UK more than they do with other countries. On average, 1.9% of EU GDP depends on final demand from the UK, which appears to be fairly limited, but considerable differences exist among EU countries. Figure 1 shows which countries are most exposed to a no-deal Brexit through these two channels: composition of exports and the contribution of (in)direct exports to their GDP. The UK’s neighbouring countries: Ireland, Belgium and the Netherlands are particularly exposed. Note that, due to the large share of re-exports in Dutch exports, the trade-weighted tariff for the Netherlands is not fully representative. Although Malta is also highly dependent on final demand from the UK, this is almost entirely concentrated in the services sector, which is less affected by tariffs. Slovakia, Poland and Denmark also have above-average exposure relative to the EU-27 average. Cyprus has the highest trade-weighted tariff within the EU. EU-wide, the data shows that mining and quarrying companies are most dependent on final demand from Britain. 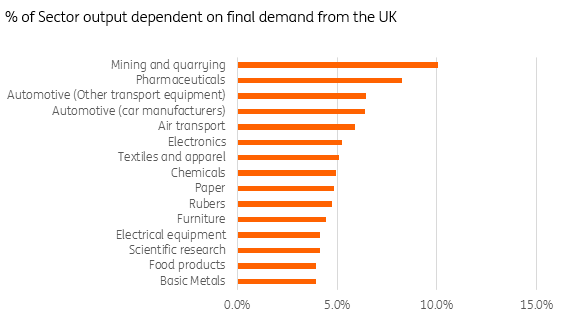 But mining companies are unlikely to be among the hardest hit by a no-deal Brexit because tariffs for these sectors are generally less than 1%. These goods will also be less affected by frictions arising from the sudden exit from the EU single market. However, it's a different story for automotive companies and food producers, as tariffs on these types of products are much higher and the dependency on British demand is above average as well. The UK's exit from the EU single market in principle means that European goods will be subject to checks at UK borders to ensure they comply with UK rules. The likely increase in costs could be a reason to refrain from exporting to the UK. Indeed, this could potentially dwarf the impact of tariffs. Food/animal products tend to be the most heavily scrutinised. As things stand, neither Dover nor Calais have the necessary Border Inspection Posts (BIPs) to provide veterinary checks – although France is in the process of building the necessary infrastructure on its side. Take the example of fish – the UK exports 81% of what it catches, and imports a significant proportion of what it eats. Given the limited capacity to perform the veterinary/phytosanitary checks, there is the potential for long delays on both sides of the Channel – bad news if you are trying to get fresh food transported quickly. The UK government has already said there would be no realistic option to perform checks at the Northern Irish border. This may induce more scrutiny from EU customs at the UK borders as this offers incentives for smuggling. Port frictions will also be a major problem for just-in-time supply chains. The British Freight Transport Association has estimated that for each extra minute a lorry spends at customs in Dover, roughly 30 km (17 miles) of additional queues would form on the major M20/A20 roads. This potentially raises the cost of transport and reduces the viability of lower-value shipments. A similar situation could occur on the French side of the border. A range of surveys suggests that firms are ramping up contingency planning for a no-deal Brexit. These preparations come at a cost, and in the short-term, this planning process will continue to weigh on investment in the UK and Europe.